Excellent seller.... A++++++ fast shipping! Excellent transaction. Fast shipping. Very Nice watch. Thanks! Thank you! Watch arrived 1.4.2019,thank you,Bohumil. Awesome A+++++++ Perfect eBay er!!! Quick shipping. Bulova watch . 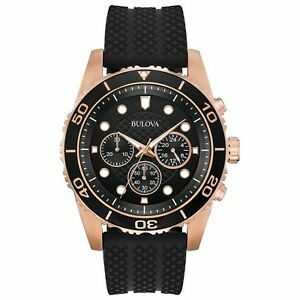 Very nice watch...I have not owned a Bulova, however the quality is good, and it is a solid watch. The crystal could be a scratch proof. I think I scratched it without hitting it very hard. I'm tough on my watches, however I like it a ot, and its a good value for the money. Ken G.